Explanation: Yes, but can your blizzard do this? 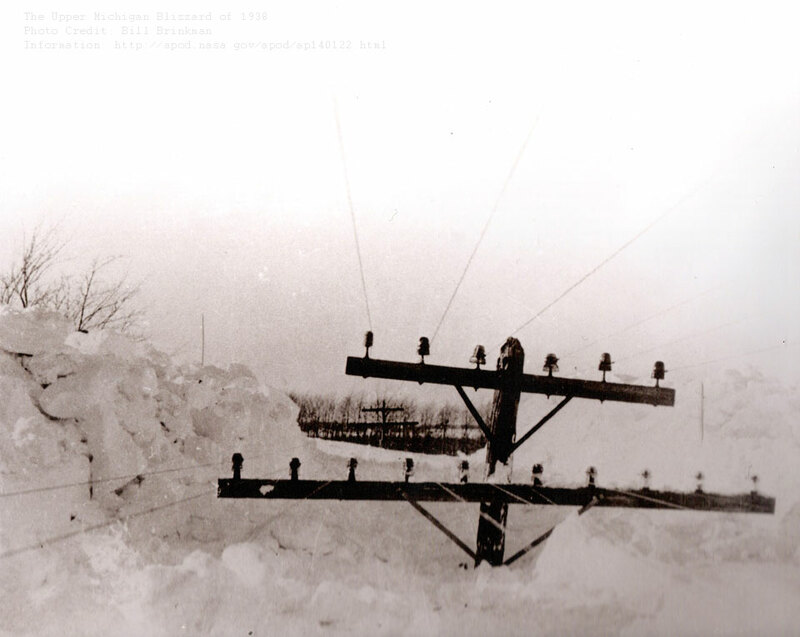 In Upper Michigan's Storm of the Century in 1938, some snow drifts reached the level of utility poles. Nearly a metre of new and unexpected snow fell over two days in a storm that started 76 years ago tomorrow. As snow fell and gale-force winds piled snow to surreal heights; many roads became not only impassable but unplowable; people became stranded; cars, school buses and a train became mired; and even a dangerous fire raged. Fortunately only two people were killed, although some students were forced to spend several consecutive days at school. The above image was taken by a local resident soon after the storm. Although all of this snow eventually melted, repeated snow storms like this help build lasting glaciers in snowy regions of our planet Earth.